I have returned to my roots. I grew up in the inner city, and have come back temporarily to help my mother who has just had a hip replacement operation. I took this photograph in a nearby park. My dear dog (who is part kelpie) doesn’t know what to make of the city. She is very grateful for this off lead park where she can run and chase her ball. It is easier to be numb in the city. There is bitumen under my feet and the sky is polluted by bright lights even when there is no moon. It’s noisy, smelly and busy. The sensitivities that are natural for me in the country don’t work for me here. I have to shut down a bit to shut it out. thanks Donna – it is a pretty place. What a nice thing to do for your Mother. Hope she recovers with ease! 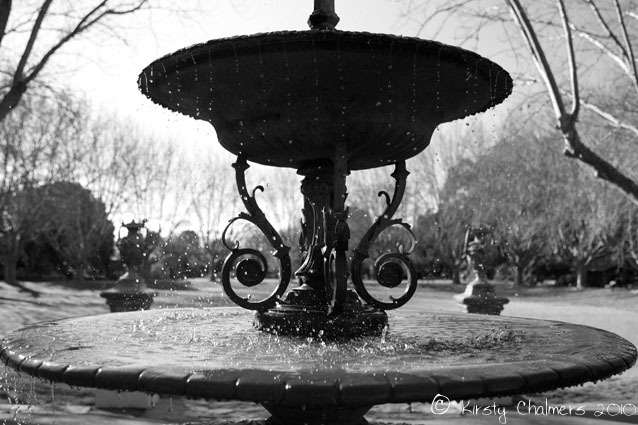 Love the black and white with silhouetted fountain. You will soon be in the open again. When I visit the city I try to take time to see the things I miss out on, otherwise, like art galleries and museums. I watch the people. I try to soak up the shapes and the colors and the bustle so I know something of it. I often think of the difference of lives led there and how people do stay sensitive to what is going on around them. What really bothers me a lot about cities is that the people that live there usually have a higher cost of living in regard to their rent and their groceries. Things we have to pay to have a spot in this world. It seems like they pay a lot more for a lot less. I don’t get that. Another thing I think about is “what if everyone spread out? How much open space would be left? Would it be appreciated? I don’t know the answer to that. Thanks Leslie, it’s so true that the city offers things that the country doesn’t. We have an exhibition of European Masters as well as Tim Burton memorabilia in melbourne at the moment. I am going to try to see them both. I have already seen the movie Inception, which I loved. The prices in the inner city are outrageous. My Mum has lived here for around 30 years and in that time her home as increased in value to 20 times what she paid for it. Nevertheless it is still a tiny little house!. In the country, we can be wide open. In the city – that’s a recipe for overload. Sorry to hear about your mom. My mother had one a few years back, and last week fell and broke her femur. Beautiful monochrome. Just think of all the new (and different) photo ops in the city! Look forward to seeing each and every one! Yes Kate, that’s kind of what I was trying to say. We take up more space when we have space, and have to contract when we get into crowds. I haven’t had many opportunities to shoot as I have been pretty full time caring for my Mum. Unfortunately she is back in hospital today. She will be there for a few days, so I’m hoping to get out and about with my camera tomorrow. Ahh, I know too well what you mean about the city, and too little what you mean about the country! While I love city life, I have been yearning more and more for some space free of congested traffic, polluted skies and overcrowded spaces…. At least you still capture beauty everywhere with your photography! gee thanks Ruby, that’s a lovely thing to say . Yes, it’s true, the city’s not all bad, just takes a bit of adjusting to. Lovely photo – there’s something about a black and white picture that encapulates time – and you’ve certainly captured it Kirsty! This park has been here a long time, and has been restored in the style of its original era. Perfect place for black and white! Thanks Lynda. yes, you were such a little pumpkin when you first played there and now look at ya! I have to admit I love dense urban areas, but then again being a biologist allows me to get away from it all. Nice pic. Hey FJ, I admit to preferring the inner city to the suburbs that’s for sure. But I can’t be here too long, I miss the wide open spaces. Hi Kirstyfliesfree. I too find it difficult to be in urban areas. Though I agree with FJ that suburbs are much much worse usally. I think it has something to do with the fact that in many suburbs there’s like totally conformity of housing and lawns and all this required neatness that is dysfunctional. In dense urban core/city areas there’s tons of people energy–and way too much concrete and steel for it to bounce off and crazily. My first goal in any city from Portland, OR to DC is to FIND the green areas–the parks and streets with older trees. Those areas usally help me deal with the rest. If all else fails, well, cemeteries usually have some sort of green space–and are gennerally ‘peaceful’ in comparison. Hope your mother recovers soon. Looking forward to more of your camera art as you find some balance getting around.